There are several factors that may contribute to restlessness after a workout or athletic competition. The increase in heart rate over an extended time, along with an increase in core temperature and sweating, has an effect on the nervous and endocrine system. This excited state triggers the hormones cortisol and norepinephrine, which may play a role in keeping you up. Adrenaline is also released but lasts for a much shorter time than norepinephrine, which can have an influence for up to 48 hours post-exercise. Levels of hydration, core temperature and stimulants taken can also be factors in sleeplessness. These affect homeostasis, which is the body’s natural way of restoring balance. Getting a good night’s sleep is crucial for optimal athletic performance and recovery. Here are some natural sleep aids that may help. Melatonin is a hormone naturally produced by the body, which signals your brain that it is time to sleep. This is great for combating those evenings when your mind will not shut off. It has been shown to reduce the amount of time it takes to fall asleep and increase the quality of sleep. It can also help regulate sleep schedules. Melatonin is one of several natural sleep aids that can be found in most drug stores, often in tablet or gummy form. CBD is a patented antioxidant. As an antioxidant, CBD plays an important role in helping your body restore homeostasis or balance. In some cases, pain and discomfort are caused by an imbalance in your body, which can ultimately result in poor sleep. Using CBD for sleep improvements when you are in pain or discomfort, is likely to help you fall fast asleep. 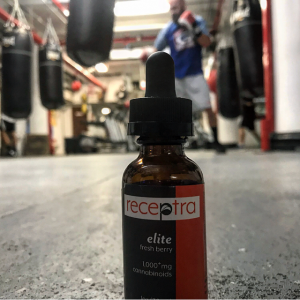 Receptra Naturals is one brand that is used by many boxers and MMA fighters. If you are a tea drinker chamomile or teas specifically marketed for sleep aid (usually containing chamomile) may help, just remember not to load up on the sugar or honey. One of the active compounds in the chamomile plant is apigenin has been found to reduce the need for the body to move frequently, inducing a calming effect that promotes better sleep. This may sound like something your grandma would do, but there is justification. Milk contains tryptophan, which is a sleep-inducing amino acid. This increases the amount of serotonin in the brain, which works as a natural sedative. The honey is a carb and works to transmit the hormone faster to the brain making it one of the tastier natural sleep aids. Just don’t overdo it on the honey. Studies have proven that lavender aids in sleep. The calming aroma can be dabbed on the skin, used as an essential oil in a diffuser or sprayed on a pillow before bed. There are even pillows available for purchase that are pre-filled with lavender.